The 2003 Topps Baseball design is notable for a couple of things. The most obvious is the use of blue borders. The other is the inclusion of a small complimentary player portrait on the front for the first time since 1984. Inserts show an increased move towards nostalgia, both in player selection and retro card designs. The complete set has 720 cards spread across two releases. 2003 Topps Series 1 Baseball includes numbers 1 through 367. Series 2 has the remaining 354 cards, running 368 to 721. There is no card 7. This was intentional as Topps retired the spot in honor of Mickey Mantle. Subsets include team photos, managers, Draft Picks, League Leaders, Season Highlights, World Series, Future Stars and more. 2003 Topps Baseball has two base set parallels. 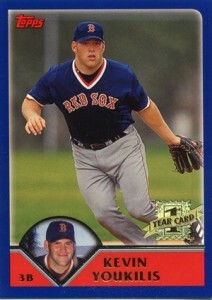 For the third consecutive year, Gold cards come numbered to the year of release, in this case, 2003. Black cards are numbered to 52. The set also has 45 logo variations that use the old Topps logo. These cards are extremely rare. Several basic insert sets return. These include Hobby Masters, Hit Parade, Own the Game and Topps All-Stars. Record Breakers is a 100-card insert set (50 cards in each series) that spans several generations. It mixes current players with retired stars, honoring individual achievements. Numbered according to the players' initials, Series 1 cards have a purple background. Series 2 cards are green. Record Breakers also have relic and autograph versions. Blue Backs (Series 1) and Red Backs (Series 2) pay tribute to 1951 Topps Baseball. 2003 Topps Baseball has several additional autographs and memorabilia cards. Among the signers with basic autographs are Albert Pujols, Joe Mauer, Mark Teixeira, and Lance Berkman. The ongoing Team Topps Legends set that began in 2001 continues with on-card autographs from Willie Mays, Carl Yastrzemski and others. Included in both series, Prime Cuts Pine Tar Series has three tiers of game-used bat cards. The most common are limited to 200 sets while the rarest have a print run of 50. Series 2 jumbo packs have exclusive stadium seat relics that pay tribute to closing of Cincinnati's Riverfront Stadium. 2003 Topps Baseball Retail and Holiday Factory sets each come with their own set of five exclusive draft pick cards. The first five are in the Retail sets. The second half of the set can be found in Holiday sets.